Just a thought from 6 July 2003 about Stories. 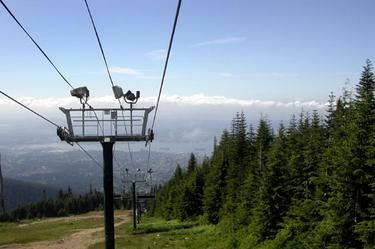 The young lady with the missing nose ring who was manning the Screaming Eagle Chair Lift on Grouse Mountain (appropriately named, judging by the overheard tourist conversations) asked me where we were from. "San Francisco," I said. "But Heather is Canadian." "Oh," she said. "Then I like her better." Such is the state of relations with our neighbor to the north. My jokes that I left my home country for July 4 because I didn't want to encourage it fell flat, as the chair came and scooped us up and delivered us to a sweeping view of Vancouver through the trees. Appropriate, then, that the reading material we brought with us to the Sylvia Hotel begins with an essay on America and Canada called Northern Light. In it, author Hendrik Hertzberg discusses the neighboring countries as old friends, struggling to stay on pleasant terms. Favorite quote: "Good old Canada. It�s the kind of country that makes you proud to be a North American." This section is called Just a Thought. It's a blog where I post little pieces of what I'm thinking about at the moment. This page is an individual entry called “Greetings from Vancouver” that I wrote on 6 July 2003. Before this, I wrote a little something called “The Orchid” on 1 July 2003. After this, I wrote “Urban textures” on 7 July 2003.